December 15 – December 21: 26 Weeks 0 Days – 26 Weeks 6 Days. I first felt the baby kick when I was eighteen weeks pregnant: there was a single little jab below by belly button, then I didn’t feel her again for a week or two. Gradually I started to feel her more and more frequently. The baby is kicking, shifting, and stretching all the time now. She seems to move most when I’m eating or lying down, so I assume she falls asleep when I’m moving around (probably a good trick to remember for when she’s out of the belly). The baby changes positions frequently. It feels as though some days she’s set up to make firm contact with my abdominal wall and other days she’s positioned to kick the placenta (which is in the front)—my sensation of her movements can be unmistakeably strong or barely perceptible. When the baby kicks outward, it’s sweet and amazing, but she occasionally kicks downward to make contact with my pelvic floor (and bladder), which is shocking, or upward to hit my stomach, which I think contributes to heartburn. A week or two ago, Baby Center told me it was important that I start tracking the baby’s movements, and if I didn’t feel the baby moving for a certain period of time to seek medical attention. I have a mixed relationship with BabyCenter. I love receiving updates on the baby and when I Google a pregnancy-related topic BabyCenter nearly always has a relevant, informative article. However, the tips and articles they send me are perpetually stressing me out. Sure enough, shortly after reading the article about tracking kicks I went a whole day feeling only sensations that were maybe the baby moving, maybe not. It was also a busy day, so I may have simply not been paying attention. Richard and I went to bed late that night, and I told him I hadn’t felt the baby move, and that BabyCenter said I should be worried. Neither of us could sleep, so I spent the next hour changing positions to try to wake the baby up and get some movement out of her. Finally I got some kicks out of her, and Richard and I were both able to exhale and get some rest. The next day she was jump, jive, and wailing all day long so she must’ve taken a day of rest to regain her energy. The next time I saw my midwife, I asked her about tracking the baby’s movements, and she said different people had different opinions, but she didn’t ask people to constantly track their unborn baby’s movements unless there was already a reason to worry. She hit the bitten-down fingernail on the head, saying constantly tracking could just be another source of stress. If I hadn’t felt the baby kick in a while, she continued, I could drink an ice cold glass of juice then lay down—that nearly always got a baby moving. She reassured me that if I was really worried I could always come in and they could check on the baby. She was right about the cold sugar-water waking up babies. I got my gestational diabetes test done this week, wherein I had to fast for twelve hours, drink ten sickly ounces of melted popsicles within 5 minutes, and then sit around for two hours to see how my body processed the sugar (I was happy and relieved when I got my negative test results a couple days later). Although my affinity for sugar has sharply decreased during pregnancy, I still consider myself to be somewhat of a sugar addict, and I thought I would have no problems quaffing the tutti-frutti syrup. The first three minutes were okay, but those last two were torture. For the next hour I had to get up and walk around frequently to keep it down. The baby loved it though! She was kicking strongly and constantly. The big milestone this week was that I could see the baby moving. Before I was pregnant, I didn’t realize this was a thing! I was taking a shallow not-too-hot bath, when I felt a kick and saw my belly twitch. Then again. And again. I was mesmerized and in awe. It was also a little creepy, but I got over that. After I got out of the bath, I marveled with Richard a little longer as she continued to show us her kicks. I haven’t seen this again in the days since, so I think she was positioned perfectly that night to make an impact. This weekend, I had a wonderful baby shower with my family and my high school and university friends. My sister and friend were telling me toward the end of the third trimester, you can very clearly see the rolling and shifting of the baby. I’m looking forward to that amazing and weird experience! 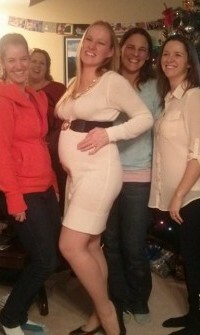 Bump update from my Canadian baby shower at 26 weeks. This entry was posted in Mindful Pregnancy and tagged kicks, milestone, pregnancy, stress by Barbie. Bookmark the permalink.